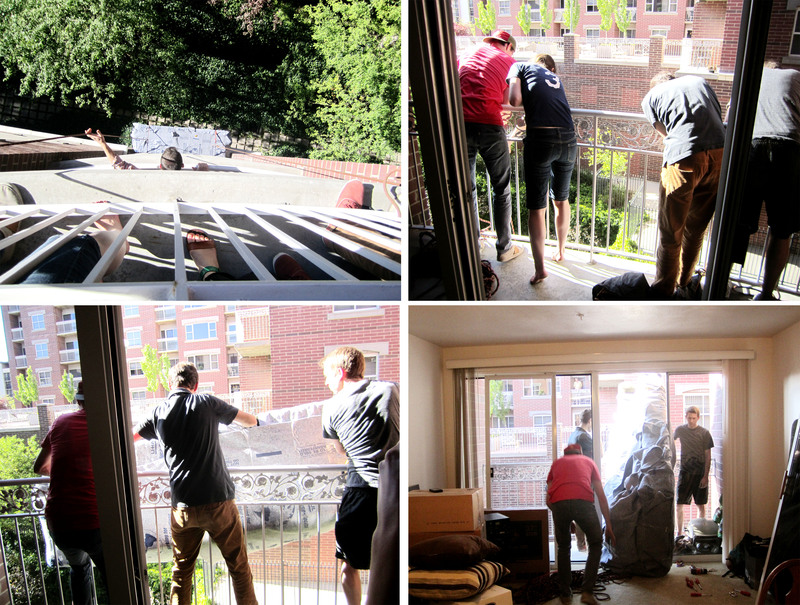 sadly we had work and school all day when my sister kelli and her husband andrew moved into their new apartment downtown, but we did get their just in time for the real action: using a pulley system to bring a couch up six stories, over the balcony and through the sliding glass doors. the couch wouldn’t fit through the front door, so this was the wild and crazy plan that andrew and his friend came up with. i thought it was funny that we had three of the most slim and slender gents trying to pull this thing up 6 stories…but they did it! they really did it! …but only after a half-way break for a waffle dinner provided by moi. so i’d like to think i was the biggest help in the whole affair. we are glad to have the bonins move to our side of town from provo. they live one block away! and now we can make a better argument to have more of the family parties in SLC. yay for saving gas money! This entry was posted in kunz life, salt lake city and tagged bonins, moving, slc. Bookmark the permalink. It was definitely the waffle dinner that really got their creative juices flowing. Thanks again! We’re excited to be neighbors! So happy you 4 are there together! We’ll come to the family parties!